The hammam is a traditional bathhouse experience that locals use as a regular means of socialising and self-care. Following the ancient historic practice of Islamic public bathing, hammams today can be anything from an upscale luxury affair to a simple public bathhouse. The basic hammam experience usually involves a ritual cleansing routine, and in some cases, an argon oil massage. A few local favourites include the Hammam dar el Bacha, the highly photogenic La Mamounia, and the Royal Mansour. Hammams are traditionally gendered spaces and most people (if not all locals) go naked in the communal baths. No trip to the Rose City is complete without a night in the heart of the medina. 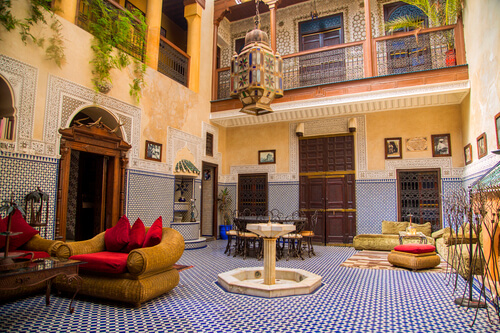 A riad is a traditional Moroccan townhouse with an inner courtyard designed for privacy and tranquility in an otherwise bustling city area. While some riads can be pricey, a little research unearths affordable boutique spots like the Riad Shambala or the Riad Dar Mouassine. While some places offer a more traditional experience, a recent increase in restoration and conservation efforts have paved the way for modern, design-conscious riads. This late 16th-century royal complex is located on the Rue de la Kasbah and offers visitors a splendid glimpse at what was widely considered a golden age for Marrakech. A series of sultans expanded and beautified the original tomb into a larger three-room mausoleum with exquisite tiles, cedar wood, imported Italian Carrara marble, and gold details. Buried in the cemetery gardens are the many servants and guards that supported the Saadi royal dynasty. 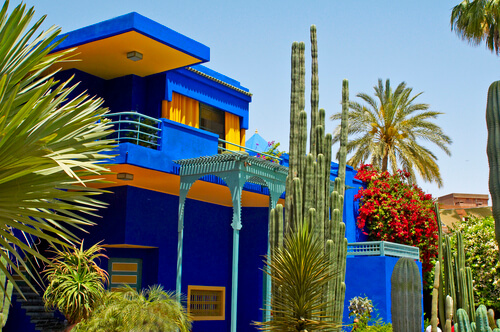 Art and fashion nerds love to pay their respects at Jardin Majorelle, an exquisite garden founded by the French artist Jacques Majorelle, for whom the vivid colour, Majorelle blue, was named. Within the garden grounds – adorned with sublime art deco details – are a Berber cultural museum and a lovely little café. Adjoining the garden is the Villa Oasis, once home to fashion icon Yves Saint Laurent and his partner Pierre Bergé. It is also the couple’s final resting place. In 2017, in tribute to Saint Laurent’s long and dedicated patronage of the garden, the Musée Yves Saint Laurent opened next door. With its exquisite blend of spices, aromas, and flavours, Moroccan cuisine is truly a feast for the senses. Besides the obvious tagine and couscous, Morocco is also known for its oranges, which make excellent fruitcakes, sweets, and freshly-squeezed juices. If you’re feeling overwhelmed with choices, there are a range of food tours around Marrakech that can help guide the way. Most tours will take you to hidden spots, where guides wax lyrical on each dish’s historical or cultural significance. Others involve intimate home-cooked meals for groups, trips to the spice markets and souks, a cooking class, or even a bit of belly-dancing to go with your dinner.